Anyone can enter, no purchase necessary, and it’s quick and easy. 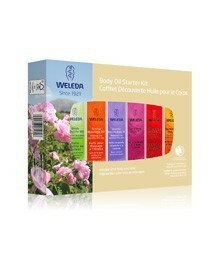 This awesome kit of 6 Weleda body oils has NO toxins, all natural ingredients, and smells great! It includes a terrific cellulite oil and Arnica massage oil for those achy muscles. Good Luck! and P.S. Much appreciation for SHARING…..it will provide incentive for bigger giveaways in the future! I use your products for my massages very nice!